From sluggish PC sales to Facebook regaining an important advertiser to a department store chain finally dismissing its inept CEO, let's go over the wonders and blunders of business this week. Remember when analysts felt that Microsoft's (MSFT) Windows 8 would breathe new life into the moribund desktop and laptop businesses? Well, it seems to be sucking whatever life was still in the box makers. 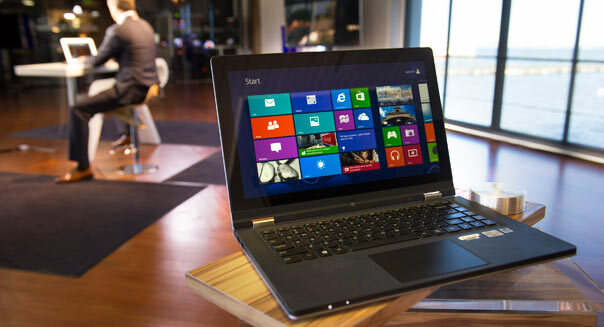 Industry tracker IDC is reporting that PC shipments plummeted 13.9 percent worldwide during the first quarter. More and more consumers are finding that they can get by with smartphones and tablets, and that's bad news for PC makers. It's also bad news for Microsoft, which is the leader in PC operating systems, but not a player when it comes to the mobile operating system space. General Motors (GM) dissed Facebook as a premium marketing platform last May, but now it's back with a mobile advertising campaign for a new Chevy car. Having GM back as an advertiser is a big deal. GM embarrassed Facebook by publicly announcing that it was abandoning the social networking website in the days leading up to the poorly received Facebook IPO. Did GM's departure raise doubts about the viability of advertising on social networking websites? Well, GM is back. Facebook will naturally enjoy the ad revenue, but what it really gains here is the validation that it was lacking when GM peeled out last year. The Ron Johnson era is finally over at J.C. Penney. Investors were initially pleased with the announcement that the struggling retailer was dismissing its helmsman, but the stock headed lower when it was revealed that former CEO Mike Ullman would be stepping in as interim CEO. Who were J.C. Penney investors expecting to step up? Did they want someone who rose up the ranks at a "cheap chic" darling before launching the wildly successful Apple Store concept that's the toast of the sale per square foot mall equation? I hope not. Going dynamic didn't do J.C. Penney any favors last time out. Better luck next time, J.C. Penney. Just know that fickle retail shoppers don't give chains too many chances. Netflix CEO Reed Hastings didn't waste any time in taking advantage of a new SEC ruling that allows companies to disclose important facts through Facebook, Twitter, and other public social outlets. "Over the last three months, you all watched over 4 billion hours on Netflix," Hastings revealed in a Facebook status update on Thursday. If Hastings posting about service usage on Facebook rings a bell it's because he did the same thing when Netflix surpassed a billion hours of member streaming in a single month nearly a year ago. Netflix is now averaging more than 1.3 billion hours of served content a month. It's Hastings' way of letting folks know that the platform continues to grow in popularity. Folks living in Austin won't just have next year's installment of the annual South by Southwest festival to look forward to. Google has tapped the trendy Texan city as the next market to get the company's bar-raising Google Fiber service. Google Fiber initially rolled out in Kansas City, offering customers online access at speeds that are 100 times faster than conventional broadband connectivity. Google Fiber also offers a high-def TV service. The dual service will set Austin residents back $120 a month, but frugal Texans may want to consider a free monthly plan that Google offers at significantly slower speeds for a one-time installation fee of $300. Google doesn't want to be your next cable provider. It just wants to make sure that cable companies that offer Internet access don't make connectivity too expensive or burdensome. Google will lead by example, and that's smart. Motley Fool contributor Rick Munarriz owns shares of Netflix. The Motley Fool recommends Facebook, General Motors, Google, and Netflix. The Motley Fool owns shares of Facebook, Google, Microsoft, and Netflix.